Look at Zoe go! The doctor is taking action in this Hart of Dixie Season 3 scene. Welcome back, Zoe. 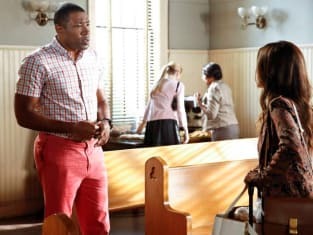 The good doctor returns to Bluebell on Hart of Dixie Season 3. Zoe is working hard here in the hospital. This is a look at the Hart of Dixie Season 3 opener. George shares a drink with Lynly in this scene from Hart of Dixie Season 3. It is from the season premiere. 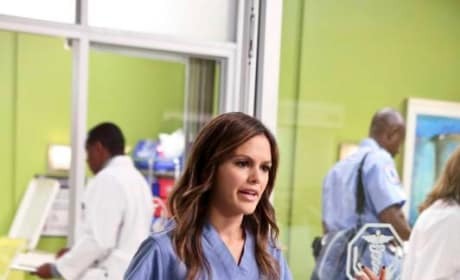 Pictured in this scene from Hart of Dixie Season 3: Rachel Bilson as Dr. Zoe Hart, Mallory Moye as Wanda, and Tim Matheson as Dr. Brick Breeland. It's the return of Zoe! Lavon reacts to this doctor coming back to Bluebell in this scene from Season 3.